Who would have guessed that the most thrilling television show of 2014 would be a podcast? NPR's Serial became an overnight sensation by re-investigating the murky circumstances surrounding a 1999 murder conviction. They surprise popularity of the podcast has led to plans for a second season, though the subject matter has yet to be determined. Because we're big fans of the show, we have some suggestions for NFL-related sports mysteries that would make a great second season (especially now that O.J. 's trophy has been found). 1) What killed the Jay Cutler/Brandon Marshall bromance? Jay Cutler and Brandon Marshall used to be best buds, first in Denver and then in Chicago. They’re good together on the field — the duo has combined for 40 touchdowns — but it appears their off -field bromance is on thin ice. First, there were rumors that Marshall called out Cutler in a postgame locker room rant during the Bears’ disappointing season. Then, last month, Marshall said he “would have buyer’s remorse” regarding Cutler’s contract. 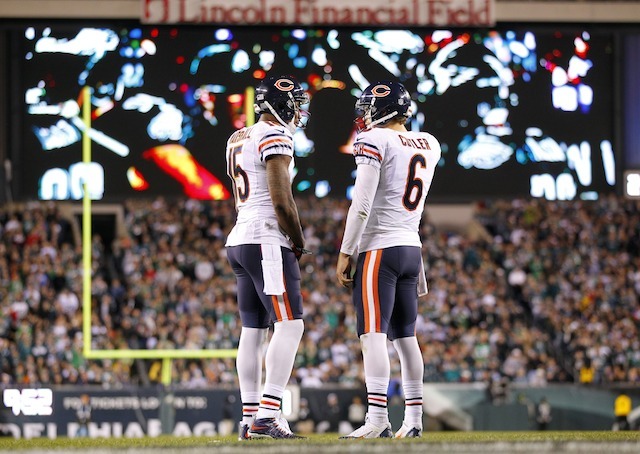 What actually killed the Jay Cutler/Brandon Marshall bromance? Was it Marc Trestman’s fault? Or was it the presence of the younger, flashier wide receiver, Alshon Jeffery? Unlike Serial’s Jay, it’s unlikely that Cutler will serve as a star witness. Instead, anonymous sources will be the best weapon at our disposal, as long as they don’t pull an Aaron Kromer. 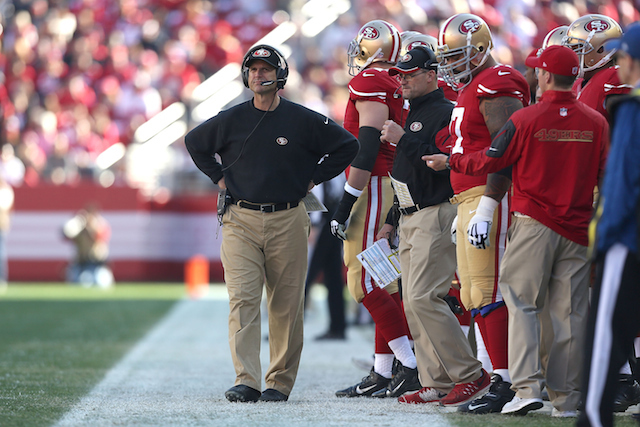 2) What actually happened between the 49ers and Jim Harbaugh? So, Serial Season 2 should be what exactly happened with the 49ers and Jim Harbaugh. Synopsis: Jim Harbaugh won nearly 70 percent of his games as the head coach of the San Francisco 49ers. In his first three seasons, he went to three NFC Championship Games and one Super Bowl. Yet, after the 2014 regular season, the San Francisco 49ers cut him loose, letting Harbaugh walk on over to his alma matter, Michigan. Why? Unfortunately, like the first season of Serial, the answer to the puzzle might be unclear; 49ers CEO Jed York isn’t exactly a transparent guy. The same goes for Trent Baalke, the 49ers GM. Instead, the key in all of this will probably be Harbaugh himself. As we all know, he’s not the best at holding in his emotions. 3) What happened between Percy Harvin, Russell Wilson, Golden Tate, and Doug Baldwin? Doug Baldwin might have celebrated a touchdown in October by paying tribute to the fight. Yeah, that’s a lot. The good news is that there are plenty of people to interview, though we’re guessing Marshawn Lynch won’t be one of those people. 4) When did Roger Goodell see the Ray Rice tape? This is easily the biggest sports story of 2014, and arguably the biggest of the decade. On Sep. 8, security footage of Ray Rice knocking his wife unconscious in an Atlantic City casino elevator was made public by TMZ. A national outrage ensued, with much of the vitriol reserved for NFL commissioner Roger Goodell, who had only suspended Rice for two games and was claiming to have just seen the tape for the first time in September. Did Goodell really never see the tape before its public release? Shouldn't he have known exactly was was on the tape anyway? Is it true that a copy of the tape was sent to the league office? For those who have their doubts about the 96-page Robert Mueller report, woudn't it be nice to see what Serial would surmise? 5) Who Derailed the Detroit Lions? Like Barstool Sports did for the Chicago Bears, these episodes investigate who did in the 2014 Detroit Lions. The Lions enjoyed their best season… maybe ever? However, their season was cut short in the Wild Card Round of the postseason, as they suffered a controversial loss at the hands of the Dallas Cowboys. Was it the referees? Was it a Dean Blandino-led conspiracy? Was it Jim Caldwell’s sudden emotional outburst?